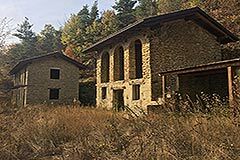 Two Part Restored Country Houses for sale in Piemonte Cravanzana Near Alba, Langhe Hills (ref: 8069)- Two Part Restored Stone Houses for sale in Piemonte. Piedmont Properties in Piemonte. Property for sale Langhe and Piemonte.